The water vole is Britain’s fastest declining mammal! The water vole (Arvicola amphibius) is Britain’s largest species of vole. A semi-aquatic rodent, it has a rounded dark chestnut brown body, short ears, blunt muzzle and furry tail. It is also confusingly known as a water-rat but doesn’t look or act like a rat. Water voles require thick, dense vegetation along water ways to provide shelter from predators and areas to feed. Each vole lives in a series of underground tunnels which they dig into the river banks. They are never far from the safety of the water. Water voles, in particular pregnant females, are highly territorial and will fight to the death to defend their homes. Water voles are herbivores. They eat plants near that grow near the river. They prefer reeds, sedges and rushes which grow during the spring and summer. In the autumn they also eat fruit and berries. Tree bark provides food in winter when other food is scarce. Pregnant females eat flowers, crayfish and molluscs to increase their protein intake. They need to eat 80% of their body weight in food, per day! There are over 200 different plants that water voles have been recorded eating. Water voles are short lived. Most live for 5 months, some can live for up to 2 winters. Lots get eaten by predators, especially American Mink. Up to 70% die during the winter months because they can’t find enough food, the weather can get too cold and flooding can destroy their homes. Baby water voles, called pups are born between March and October. Each female water vole can have 2-5 litters each year with 5-8 young in each litter. After 3 days the pups eyes open. Nests are made out of grasses woven together into a soft hollow ball inside the burrow. 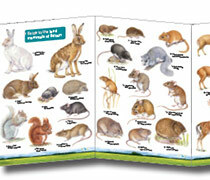 Latrines – water voles choose to leave their droppings in specific toilet spots called latrines. These are found near the edge of the teritory, where they enter the water and near the burrow. They mark the latrine with their scent to claim their teritory. Above-ground runs – small tunnels like pathways in the surrounding dense vegetation created when foraging for food. Plopping sound – when disturbed water voles dive into the water and kick up a layer of silt to hide under. 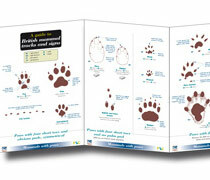 Footprints – water voles have four toes on the front foot and five on the back foot. The toes splay out to look like a star. You can find these prints in the soft mud at the water’s edge. They are only 26mm-34mm long so you’ll need to look carefully to spot them. Some of the best spots to see water voles are at Arundel – outside the castle walls in the moat or take a boat ride at Arundel Wildfowl and Wetland Centre; and Titchfield Haven National Nature Reserve – take a walk along the canal for the best views. During the 1990’s water voles suffered a 90% population decline, as a result of habitat loss of riparian vegetation and the accidental introduction of American Mink in the 1950’s. Water voles are protected by law. It is an offence to kill, injure or disturb a water vole, or damage its home. To help water voles thrive we need to restore their habitat and control the invasive american mink population. 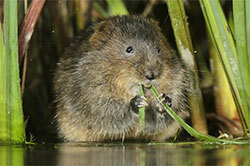 Rangers and volunteers began reintroducing water voles to the River Meon in June 2013. Before reintroduction could begin, work was carried out on long stretches of river bank to create additional, suitable habitat for water voles and the resident population of American mink were trapped and despatched. Over 2,000 water voles were re-introduced along two-thirds of the River Meon between 2013 and 2017. The first reintroductions were near the mouth of the river at Titchfield Haven National Nature Reserve and subsequent releases moved upstream, reaching Exton by September 2016. Volunteers have completed post-release surveys on the river between Titchfield Haven and East Meon and field signs indicate there is now a healthy, breeding population of water voles on this stretch of the river. Field signs also indicate that water voles have colonised areas outside the original release sites. ‘Ratty’ from The Wind in the Willows was in fact a water vole.